Diamond Infinity Rings are a popular and fashionable trend. You see infinity symbols on all kinds of things lately. It is a trend that been increasing due to their significant meaning and elegant look. Diamond Infinity Rings make a great addition to any type of ensemble and can add a personal touch to your style and look. We also have earrings and pendants made with the infinity symbol to pull the motif together. The infinity symbol is similar to an elongated, sideways figure eight. To many, the infinity symbol symbolizes its more modern interpretation of eternal and everlasting love. However, to others their affinity for the infinity stems from its ancient symbol of perfection, duality and empowerment. Whatever it means to you, Diamond Infinity Rings are a very popular genre. This Infinity Bypass Ring is just one of many custom Diamond Infinity Rings from Valeria Custom Jewelry. The 33, 1mm diamonds weigh around 1/4 tcw and provide an excellent highlighting of the infinity symbol intertwined with the split shanks. The ring could be made with larger stones that would open up possibilities in terms of the stones that could be used. This Infinity Engagement Ring is another of the many custom Diamond Infinity Rings we have created. 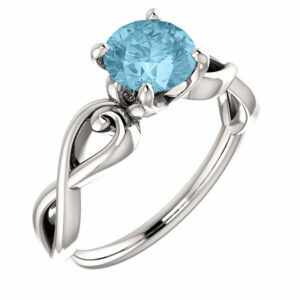 This 6mm Round Blue Topaz is flanked by an Infinity design, but we could easily make this with a diamond. Simple as that. The infinity symbol is an old symbol – throughout the millennia and within various cultures the infinity symbol was used to represent different concepts and ideas. One of the oldest meanings that originated in India and Tibet, where the symbol represented perfection and harmony between the male and female genders. The infinity sign also appears in numerous mystical Celtic knot designs – which just like the infinity symbol, have no end or beginning. In addition, the Celtic knot designs actually bears a high level of resemblance to the Double Infinity Symbol, which is a representation of “double absoluteness”. The infinity symbol was originally called the Lemniscate, meaning ‘ribbon’, by the ancient Greek mathematicians and philosophers. The idea formed the basis for the Ouroboros, an ancient symbol depicting a snake biting its own tail. It represents the infinite immortality, continuity, self-fertilization and eternal life. This Princess Infinity Engagement Ring was inspired by awareness ribbons with one on each side of the center stone that is accented with 1.3mm stones. The center stone is shown as a princess, but any size or shape can be used. The infinity symbol that we know today was first discovered in 1655 by English mathematician John Wallis. It is a mathematical and physical term that refers to a quantity with no bound or end. Basically, a quantity larger than any number. The word is derived from the Latin infinitas or “unboundedness”. Scientologists call this the idea of the infinite the eighth dynamic, which is the urge towards an eternal and infinite existence. The eighth dynamic also is named ‘the supreme being’ or ‘creator’. It embraces the wholeness and endless capacity of everything. We don’t make claims about any of that…we just like the symbol for our Infinity Diamond Ring designs! This is one of our Diamond Infinity Rings with skulls on it. Two of them guard the center stone. The shank is a fishtail infinity setting with 1.5mm stones in it. The Infinity is a familiar and instantly recognizable symbol when worn on jewelry. 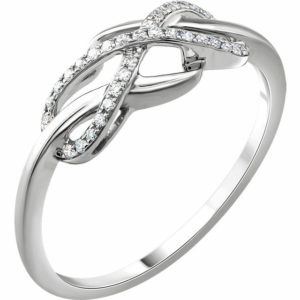 Infinity Diamond Ring are also a great way to express infinite friendship and love. They work for lovers, mothers, daughters, even just people who like the idea of infinity. This Infinity Diamond Ring has a few more twists than our infinity ring below. This 2 Tone Heart Ring has hearts both underneath and on the sides of the 3mm center stone. The band starts at the bottom as an infinity symbol and ends up at the center stone as a heart. It is shown in 2 tone with but we oculd easily make it one metal. We think it would look better with a center stone of at least 5mm. It is also possible to add stones to the band. Although the infinity symbol has become a secular mathematical/scientific symbol for infinity in numbers and eternal time & space, the symbol derives from a religious place, which has enabled us to determine such spiritual and positive meanings. At Valeria custom Jewelry, we can create a wide variety of Diamond Infinity Rings. Please contact us with your idea. We know you have tons of options to find Diamond Infinity Rings from. However, not all jewelers are created equal. We stand above the rest with the skill, value, and service we offer every one of our clients. Give us a shot and you will wish you had found us sooner! 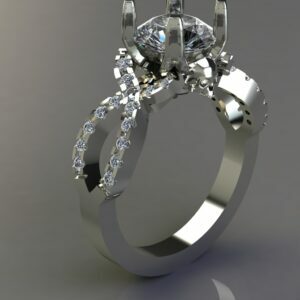 Click HERE to learn more about custom jewelry, to see our portfolio, or to contact us about our Diamond Infinity Rings. 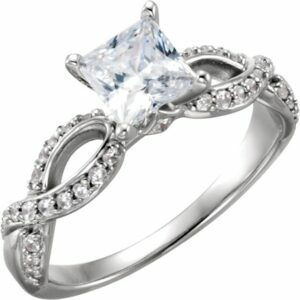 Click HERE to see our complete portfolio of custom rings. It can cost less than you think to have your very own custom engagement ring made just for you. Why hassle with the retail stores for boring and overpriced engagement and wedding rings?